#1: You've accidentally moved some of the placeholders around while adding content. The best part about having a really nice template is that it lets you create beautiful slides even if design isn't your strong point. We know that sometimes it can be really easy to accidentally move things around on your slides, especially if you're working on a laptop with a trackpad. The reset button is the perfect remedy to that problem! Surprisingly, few people seem to know that it exists! #2: You want an easy way to undo some creative changes if you decide you don't like them. If you've only got a very basic template to work with, it makes a lot of sense to try out some custom designs yourself. 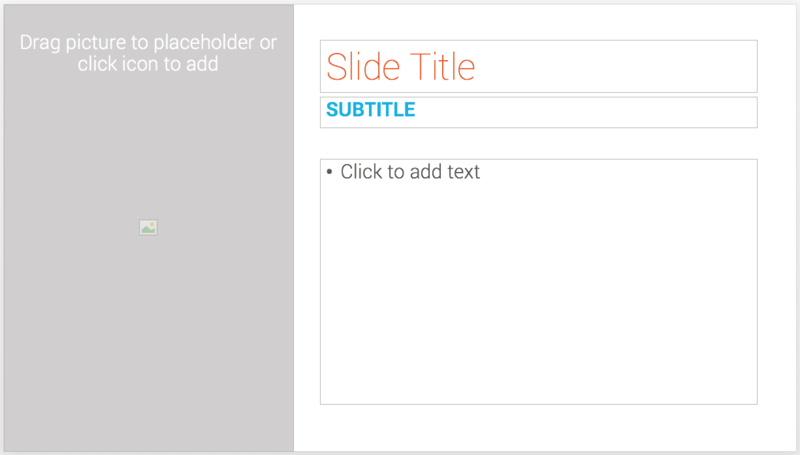 You want your content to look it's best, and sometimes that means customizing the layout of the slide. You might, however, not feel very confident in your design skills (we can help with that too), or you think the slide is ok how it is, but still want to try out a few alternate looks without having to worry about running out of undo's. You can relax knowing that no matter how many things you've changed on the slide, it only takes one click to change everything back! Where is this magic button!? You can find the reset button in the top left of the ‘Home’ ribbon, right next to the ‘New Slide’ button. Start with a template slide. 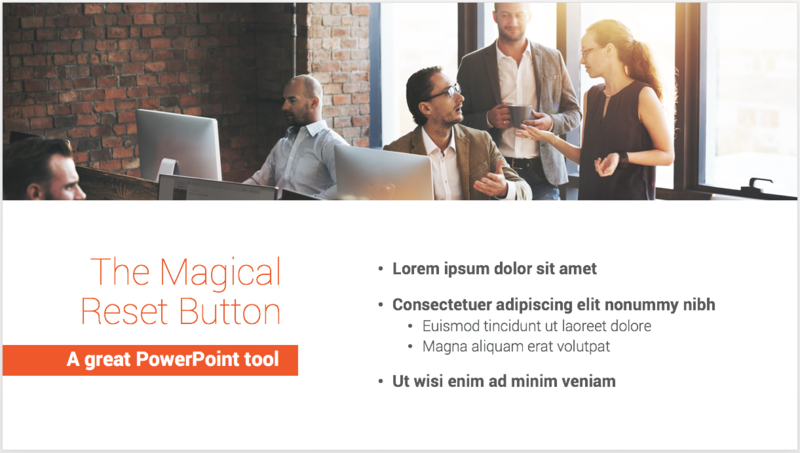 It’s necessary to have an initial state for PowerPoint to reset to. The reset button works by returning the placeholders to their original location and changing the formatting (eg. fonts, colors, effects) back to what has been assigned in the template. Add content to the placeholder boxes. 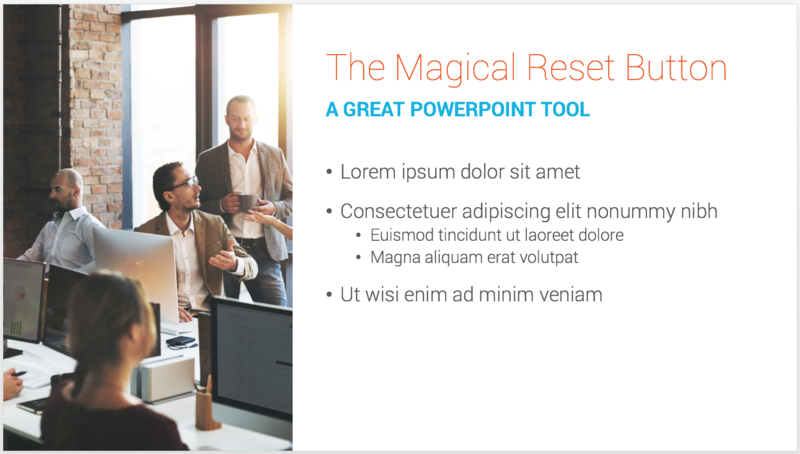 It’s a good idea to add all your content to the slide before you start moving things around, since this way you’ll have a clear idea of what the slide will look like when (and if) you do choose to reset it. Move content, change fonts, add colors. Any change you make to the placeholder boxes can be reset. Just remember that if you add a new element–one that wasn’t part of the template–it will stay right where it is when you use the reset button. One click and everything’s back to how it was! Phew.